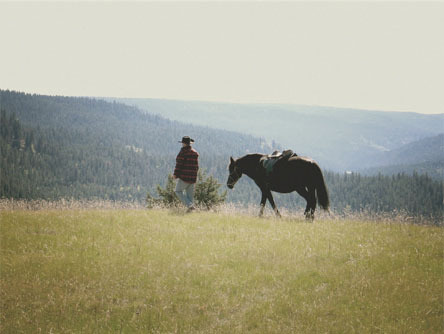 Our property sits on the edge of a plateau rising over Deadman Valley west of Kamloops in the Southern Interior of British Columbia. It’s called Kukwaus Plateau on the maps, on the border between the Cariboo and Thompson regions, and a part of the larger Bonaparte Plateau. We’re at an elevation of 3300 feet (1000m). The country is comprised of gently rolling hills, with many natural meadows, Aspen groves, and some more densely forested areas with Lodgepole Pine, Douglas Fir and Engelmann Spruce. The old ranchers and First Nations call our place the Plaiu, named for the wild onions that abound each spring, along with stunning displays of wildflower meadows. The name Singing Lands was chosen by a former owner when he heard angelic singing that he believed to be supernatural in origin. Follow either Highways 1 & 5 to Kamloops via Merrit, or Highway 1 to Cache Creek. Either route is roughly the same distance to Singing Lands, and each offers their own unique scenery. The Hwy 1/5 option is quicker in summer, while the windier Hwy 1 takes you through the beautiful Fraser and Thompson River canyons. Heading straight north for 56 km after branching off Hwy # 1 between Savona and Cache Creek, this is a spectacular, scenic drive. The road turns to gravel shortly after leaving the Highway. It follows the Deadman River all the way, until it climbs out of the valley bottom and onto the plateau shortly before reaching Singing Lands Ranch. Take your time and enjoy the scenery and the wildlife. Deer, moose, bighorn sheep, eagles, and hawks are all common sights along the way. Fantastic colorful rock formations make a dramatic backdrop to the few ranches and cabins that constitute the Deadman Valley population. One site is protected as Castle Rock Provincial Park. 6 lakes are dotted along the upper half of the road: Mowich, Snohoosh, Skookum, Deadman, Outpost and Vidette Lake. Deadman Road is government maintained, open year round to a point about 5 km past our place and is always drivable with a 2-wheel drive vehicle. From Kamloops, take Highway 1/97 West towards Cache Creek/Prince George. Approximately 8 kilometers past the Savona Super Save gas station you will cross Deadman Creek. Take the next right on to Deadman-Vidette Road near the top of the hill. If you come to the Big Sky gas station on the highway, you have missed the turn off. Follow Deadman road all the way up the valley. At ~km 50 you will pass the Vidette Lake Resort and continue on up the steep hill to the plateau. At km 56 you will cross our cattle guard with the Singing Lands sign on the right. 1km after crossing our cattleguard, turn right in to the driveway beside the corral at the second Singing Lands sign. From Cache Creek, take Highway 1/97 East towards Kamloops. Approximately 30 kilometers past Cache Creek you will come to the Big Sky gas station. Take the next left on to Deadman-Vidette Rd 1500m past the gas station. If you come to the town of Savona, you have missed the turn off.